TimeZero is the new, exciting time travel setting from Gramel. In this setting you will play as a trained Operative, a member of TimeGuard, the secret organization that fights time crimes along the continuum. Time Thieves, chronoterrorists and many other incredible dangers await your across the millennia of human history! You need this book and a copy of the Savage Worlds core rules to play this game. 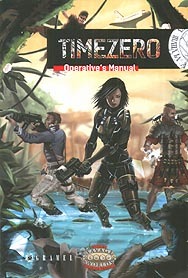 It is divided into two parts: the Player's Guide, where you'll find background details and rules for quickly creating time-cop agents, and the Game Master's Guide, containing advice on running a time travel game, how to design your time-travelling adventures and a selection of time travelling opponents. Now synchronize your watches, because time waits for no man!